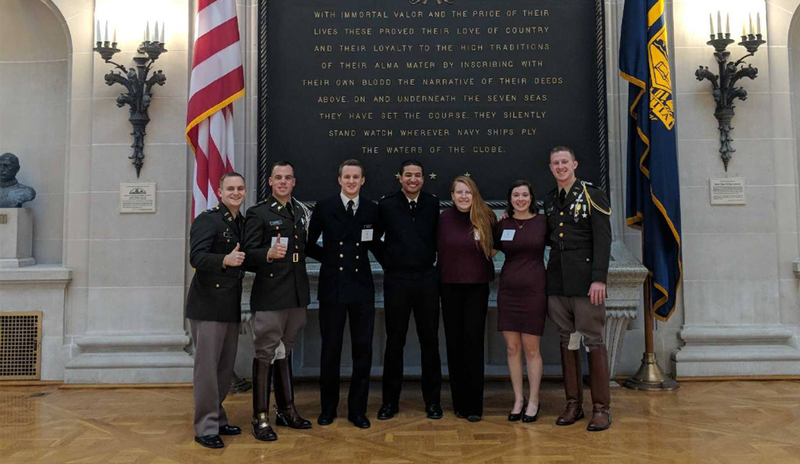 On January 21-24, I had the opportunity to attend the 2018 Naval Academy Leadership Conference: Obstacles are Opportunities. The conference featured three days of incredible speakers, including business owners, Navy SEALs, and high-ranking government officials. From the conference, I learned several valuable lessons about what it takes to succeed in leadership roles. Specifically, the recurring themes that were reiterated by nearly all of the speakers were the importance of trust, humility, and vulnerability. In order to lead successfully, a leader must earn the trust of their peers, recognize that their accomplishments are only possible because of the team of people they have around them, and be open and responsive to criticism. These lessons were specifically highlighted in the keynote address given by John Foley, a United States Naval Academy graduate and a former Blue Angel solo pilot. CDR Foley opened his presentation by highlighting what he believes to be the three most important things that a leader can do: connect, align, and commit. As CDR Foley explained, a successful leader needs to connect to their team and engage and inspire the people who work with them. A leader also needs to align with their teammates and work closely with them because a leader’s team is their greatest asset. And lastly, a leader needs to commit to the mission or cause and recognize that they are working for something bigger than themselves. Through his time with the Blue Angels, CDR Foley experienced first hand the importance of trust and unity among a team. The Blue Angels perform extremely precise maneuvers. One mistake by any of the pilots could result in not only their own death, but also the deaths of their teammates. CDR Foley highlighted the crucial role that trust played in his ability to preform as a Blue Angel solo pilot. However, he also underscored the fact that all team members had to trust each other equally and that this trust had to be earned. He asserted that leaders need to earn their place and prove themselves before they can lead. Leadership is not something that can be given. In order to do this, leaders need to be humble and open to criticism from their equals, their superiors, and their subordinates.